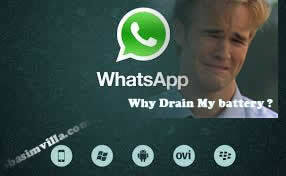 Tricks to stop whatsapp from auto-connecting to the internet on Nokia S40 (Java Phones) and Nokia S60 (Symbian Smartphones) -: This little tutorial will be very handy for most students who hardly enjoy 6hrs of steady electricity supply and yet have more contacts on their whatsapp including strangers and acquaintances. Whatsapp is one of those messaging apps out there you will get addicted to when opportune to have access to it, Little wonder why it is currently the most respected cross-platform mobile ready instant messaging app. Blackberry Messenger (BBM) is even beginning to loose popularity among the youths since the rise of whatsapp messenger, But all these do not come without a little burden to those whose phone operates on a very strict data plan and high battery consumption since the app was built in a such a way that it stays online 24hrs just like your native phone sms application. This is the major reason we are presenting this little guide on how you can quickly prevent whatsapp messenger from connecting to the internet automatically on both Nokai s40 and S60. You can easily restrict any application from auto-connecting to the internet by password-protecting your active access point setting by going to Home button =>settings=>connectivity=>destinations=>Select your active internet access point and add a password to it. This will make the app (whatsapp) prompt for the set password each time it wants to connect to the internet. Your ignoring this request will automatically restrict it from accessing your mobile data and so won’t connect till you permit it. I rarely use this method ‘cos it doesn’t guaranty zero access to the battery life, neither does it work without disturbing my peace, the only part that makes it easy and sweet is the part of Symbian phones being able to Multitask. This is the most Recommended method as this will guaranty you of a lasting battery life and zero data consumption. Firewalls and mobile security app (anti-virus) comes very handy for every Symbian Phone and does variety of things including giving you control to every apps on your phone. For the sake of this tutorial we will like to mention the free version of netqin anti-Virus which I used before writing this simple tutorial. All I did was turning on my Netqin Mobile security ==> going to firewalls ==> settings==> added whatsapp to untrusted applications list==> and that solved the auto-connection Issue. To release the app you have to go back to your firewall settings and move it back to trusted application list, That’s all you need to treat the madness of any other app that chooses this route against your wish. It is almost unlikely to see regular feature phones running on the Java Operating System accepting any kind of firewall or advanced security application, this is why I am teaching you about these alternate methods that was made available to me by Noble Ozogbuda of Noble Ict Zone. Go to menu from your center button =>locate the whatsapp application either in the games or apps directory ==>Right click on it (press the options button) =>choose delete=>when prompted with the question “are you sure you want to delete” ? ==>choose “NO”==>That’s all the connection will be stopped till another phone restart. This will kill off the internet connection (after inserting the memory card back) till when manually launched or after a phone reboot. He also mentioned about switching to a wrong provider after removing the card, that is if you are not having any need for internet connection at that very moment. Let’s get your opinion on this simple trick to stop whatsapp from automatically connecting to the internet against your wish via the comments form below. You should also include that on latest Nokia Belle Refresh Symbian OS, we can simply turn off Mobile Data option by using Drop-down menu. This is one of the must process. By the way, good post! This is very, Interesting. I am glad I found this tutorial.